Why the Browns can’t trust Johnny Manziel. NOTE: On NNR Samantha Bunten of NBC Sports and I discussed the news of the day, injuries from the previous week, and previewed all of this week’s games. Johnny Manziel just does not listen. He was given the keys to the Browns, limited as that vehicle may be, and promised he would not embarrass the team. Then he did exactly what he promised not to do—embarrassed the team. I do not believe that Manziel is capable of being a franchise, or even NFL quality, starter. But even if was the 2nd coming of Otto Graham, I would not have drafted him because of his attitude. The problem is that he will never have the work ethic that it takes to become an NFL quality QB. Just after he was drafted, he told the world that he would live his life the way he wanted. Then after playing in a couple of games including a shutout against the Bengals he admitted he did not take studying the play book seriously enough. I applauded him for checking into a rehab clinic over the off season. But then we got to this week. Once again he proved that anyone that trusted him is a fool. Those that say he never got a chance are wrong. He got his chance and then decided that it was not important enough to stay in Cleveland and work on his craft. He has no one to blame but himself. Will he ever get another chance? Probably because some coach will think he is the one that can get Manziel under control. That coach will be wrong. There is no fixing what is wrong with Manziel. If the game is not important enough to get him to focus on getting better, he will never be more than a “never was.” He might even get into a game or two with the Browns this year. The history of the team indicates that they go through 2 or 3 QBs each season. I hope that Manziel will get his life together. Often a single rehab is not enough to solve an addiction. But regardless of what he does from this point on he should be traded or cut by the Browns. That would be the best thing for the team and a shock to Manziel that might get him to become serious about his play. Comments: Comments Off on Where did Ray Farmer go wrong? Where did Ray Farmer go wrong? It is my experience that when someone in the room thinks they are the smartest person there, they are not even in the running for that honor. I think that is part of Browns GM Ray Farmer’s problem. He thinks he is smarter than the other NFL General Managers. Ray was too busy to bother to go to the pro day of CB Justin Gilbert. If he had he might have over heard Gilbert tell a team scout that asked him to return some punts “watch the film.” That scout took Gilbert off his team’s board. Ray would have been more secure in his position to have done the same thing. Ray was too busy to bother to go to the pro day of QB Johnny Manziel. If Ray had taken the time he might have found out about Manziel’s attitude about blow up swans, liquor and parties in front of people taking videos. Gilbert has been a healthy scratch despite multiple injuries at the corner back position. Manziel was named the starter for the rest of year and became the 1st QB in my memory to lose the job in the bye week without taking a snap. Not only is it time to sit him, I would have cut him. Of course as all of our regular readers know I never would have drafted him in the 1st place. Comments: Comments Off on April Fools Day extends to the Draft for the Browns. April Fools Day extends to the Draft for the Browns. Note: On NNR Samantha Bunten of NBC Sports & I reviewed the Browns offense after their free agent deals. The podcast is on https://fryingpansports.com/radio-show/. The recent history of the Browns drafts makes me think there was an April Fools Day hangover. Here are just a few of the jokes that have been forced on Browns fans. The 22nd overall pick has been a cruel joke on the fans waiting for a quality QB. 2014 Johnny “football” Manziel – The team reportedly spent 100K to decide which QB in the draft had the best chance of success based on metrics. The result was that Teddy Bridgewater had the best chance of success. 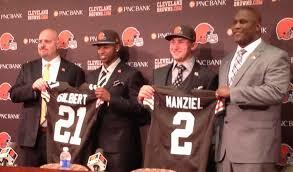 So with Teddy on the board the Browns traded up to the 22nd pick to take—Johnny Football. His season spent under the watchful eye of the coaching staff didn’t mean much when in his first start he laid a dinosaur egg against the Bengals. He spent a lot more time with blowup swans than his playbook. We all hope he can overcome his demons in rehab. While some say he deserves another chance, in my opinion he should at least have some competition before being anointed the starter. 2012 Brandon Weeden – The best thing I can say about Weeden is that at least he did not get traded at halftime of his 1st start like Charlie Frye did. In his first season Brandon completed 57% of his throws and tossed more picks than TD’s. He regressed in his 2nd year with Cleveland completing only 52.8% of his throws. By his 3rd season he was in Dallas backing up Tony Romo. 2007 The curse of the 22nd pick started with the team’s selection of Brady Quinn. Brady played in just 1 game in his rookie year. But his 37.5 percent completion rate was a sign of things to come. In 08 he started 3 games but completed just over half of his throws. That should have been enough for management but he was allowed to start 9 games in 2009. Both his completion percentage and passer rating were in the 50’s. He has now been on 5 teams in his last 5 years in the league. Comments: Comments Off on Are the Browns trusting McCown to get them the top pick in 2016? Are the Browns trusting McCown to get them the top pick in 2016? Note: On NNR today Samantha Bunten of NBC Sports & I reviewed the recent transactions in the NFL and analyzed the Browns offense. The podcast is on https://fryingpansports.com/radio-show/. Of all the issues the Browns face clearly QB is the most troubling. Rather than resigning Bryan Hoyer the Browns opted to let him leave and sign Josh McCown. McCown was brought in to Tampa to be the starter by new head coach Lovie Smith. While McCown did not produce many wins in his 11 starts (1-10) in a way he helped solve the QB issue by getting the top pick in 2015 for the Bucs. Comments: Comments Off on Pettine, Farmer and company, have a nice life. Pettine, Farmer and company, have a nice life. Note: On NNR Samantha Bunten of NBC Sports & I reviewed the Browns recent transactions and previewed the NFC South. The podcast is on http://fryingpansports.com/radio-show/. NFL NEWS FLASH: This is a quarterback league. If you don’t have a starting quality QB you will lose and be replaced by a group that will find one. You reportedly spent $100,000 on a study to see which quarterback in the 2014 NFL draft had the best chance for success. The result of the study indicated that Teddy Bridgewater was that guy. So with him on the board, you drafted Johnny Manziel. If you had been reading FPS you would have known that Bridgewater was the best available QB on the board when your second first round pick came up. But you decided for whatever reason to go with flash over substance. We saw what Manziel could do last year. First he was abysmal vs the Bengals. Then he tried to run the RG3 read option (which he never ran at Texas A&M) and ended up on IR. The comments from Mike Pettine indicate that Johnny will be much better in the new system. Just tell us what the “new system” is and maybe we can agree. Now Manziel is in rehab. That is the first decision he has made I can support. I hope he gets his life together but having evaluated players coming into the draft since 1960, I have no confidence he will ever be even a quality backup let alone a decent starter. Rather than resigning Brian Hoyer, they decided to go with Josh McCown who is 5 years older than Hoyer. Hoyer showed that he could win games. When his mechanics broke down later in the season the coaching staff seemed unaware or unable to correct them. McCown has been on 9 teams in his 12 year career. He is not a starting quality guy. Lovie Smith brought McCown to Tampa as the designated starter just as the Browns have done. McCown repaid his coach with a record of 1-10 and almost got Smith fired. The Bucs now have the 1st pick in the 2015 draft. If the Browns were listening to me, they would have used their 2nd round pick in 2012 to take Russell Wilson and the QB issues would be history. I do like that fact that Ray Farmer finally convinced a couple of wide receivers to sign. Without a starting quality QB on the team that is hard. But his pick of Manziel may do him in. Unfortunately it may also do in the entire crew.